Our Classic Table Linen, made with the finest Italian linen is timeless whether for table cloths in many sizes or made to order, placemats, napkins or cocktail napkins. The simple hemstitch finish is both classic and contemporary. 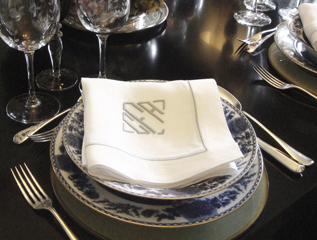 They look very special when embroidered with one of our many monograms in the colour of your choice.